Dorothy Chaney, age 97, of Aurora, formerly of Giltner, passed away Monday, May 1, 2017, at Memorial Community Care. A Memorial Services will be held later this summer during the Ruebsamen Family Reunion. Dorothy was buried next to her husband, Roy at Phillips Cemetery on Wednesday, May 3rd during a private family service. Higby-McQuiston Mortuary in Aurora is in charge of arrangements. Condolences may be e-mailed to the family through the mortuary website at www.higbymortuary.com. 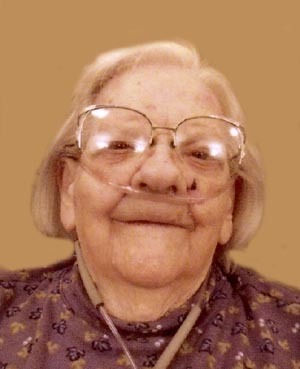 Dorothy Marie Chaney, the daughter of Albert and Anna Mathilda (Nodland) Ruebsamen, was born on a farm near Harvard, Nebraska on November 2, 1919 and passed away in Aurora, Nebraska on May 1, 2017, at the age of 97. She grew up on a farm northwest of Harvard. Dorothy attended a one room school house through the 8th grade and graduated from Harvard High School. She received her teaching degree from Kearney College. Dorothy taught in one room school houses for several years. On June 14, 1940, she was united in marriage to Roy Douglas Chaney, at Harvard, Nebraska. They farmed in Ohio, and he attended welding school. He worked at a ship yard in Loraine Ohio, and welded for Sun Oil Company. In 1944, the family moved back to Giltner, when Roy served in the U.S. Navy. They had three children: Edwin, Rosalie and Beverly. Roy farmed for several years after returning from the service and then started a trucking company several years later. Dorothy did the bookwork for their trucking company. Roy passed away on September 13, 1998. Dorothy was a member of the Giltner United Methodist Church and a long time member of the GG Club. She was preceded in death by her parents; husband; daughter, Rosalie Chaney; sister, Lucille (Kenneth) Dangler and her twin sister, Dorlene (Vernon) Hunt. Those left to cherish her memory are her son, Edwin (Linda) Chaney of Giltner and daughter, Beverly Chaney of Omaha; two grandchildren; five great-grandchildren and many other relatives and friends.